"I believe in Jesus Christ who died on the cross for the sins of mankind. What did your Prophet Mohammed ever do to save mankind?" — Asia Bibi, the words for which she is on death row, for "blasphemy." Mobs attacking blasphemy victims in Pakistan know that nothing will happen to them. According to a recent report, "Blasphemy Laws in Pakistan" published by the Center for Research and Security Studies, 247 blasphemy cases were registered between 1987 and 2012; 52 of the people involved were killed extrajudicially. The history of Pakistan is filled with hatred and intolerance toward the people who raise their voices against the blasphemy laws: Salman Taseer, the former governor of Punjab Province, and Shahbaz Bhatti, the federal Minister of Minority Affairs, were murdered for supporting Asia Bibi and protesting the blasphemy laws. 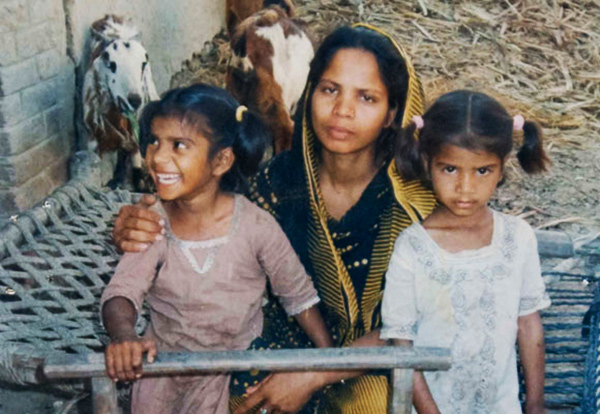 For the first time since her arrest in 2009, Asia Bibi saw a sign of hope when the Supreme Court of Pakistan gave her permission to appeal the death sentence she was served twice: first by the High Court in 2010 and again in 2014. She is, however, still waiting for justice. Asia Bibi, 50, and a mother of five, was accused of blasphemy in June 2009 by her coworkers in a dispute over bowl of water. They told her that, as she is a Christian, she could not drink water from the same bowl as they were. The argument that ensued led to an angry mob assaulting her, and her arrest on the charge of "blasphemy" -- that she allegedly had uttered derogatory remarks about the Islamic Prophet Mohammad. Bibi became the first woman to be sentenced to death for blasphemy in Pakistan. Since her arrest, her family has also faced threats which have forced them to move to an undisclosed location. "Whoever by words, either spoken or written, or by visible representation, or by any imputation, innuendo, or insinuation, directly or indirectly, defiles the sacred name of the Holy Prophet (peace be upon him) shall be punished with death, or imprisonment for life, and shall also be liable to a fine." The words that Asia Bibi said to her coworkers, in response to their remarks against her, were: "I believe in Jesus Christ who died on the cross for the sins of mankind. What did your Prophet Mohammed ever do to save mankind?" It was the last sentence that apparently incited the mob before the police arrested her. Mobs attacking blasphemy victims in Pakistan know that nothing will happen to them. The situation is common -- the incidents of Shanti Nagar, Gujran and Badami Bagh involved large-scale mob violence against the Christians and their communities in Pakistan. Blasphemy cases against Christians in Pakistan increased when the late military dictator, General Zia Ulf Haq, harshened the blasphemy laws during his rule (1978 -1988). Since then, the blasphemy laws have daily threatened the Christians of Pakistan. According to a 2013 report, "Blasphemy Laws in Pakistan" published by the Center for Research and Security Studies, 247 blasphemy cases were registered between 1987 and 2012; 52 of the people involved were killed extrajudicially. The report also compared the severity of the blasphemy laws in Pakistan to those in other Muslim countries such as Indonesia, Iran and Malaysia. The report found that the blasphemy laws are far more moderate in those three countries than in Pakistan. Although the Supreme Court's move to suspend Bibi's death sentence has brought hope, the common fate of so-called blasphemers in Pakistan is often death anyhow -- by mob violence. Asia Bibi, even if she is acquitted, will not necessarily be safe. In the case of another Christian girl, Rimsha Masih, 14, also charged with blasphemy, the evidence was doctored by a religious cleric, Khalid Chishti, who was arrested but later released: the witnesses refused to testify against him. The case highlighted the weakness of the judicial system, which, succumbing only to public pressure, put behind bars even a minor. Based on the doctored evidence, the court later acquitted Masih. In Bibi's case, her lawyer has proven that the evidence against her was manipulated by way of the delayed registration of the "first information report." The other weakness in the case is the witness: the main accuser against her is an Islamic imam who was not even present at the incident. The trial of Asia Bibi, the longest blasphemy case in Pakistan, spotlights the urgent need for international leadership, and superhuman national leadership within Pakistan, which would call for the review of the blasphemy laws. The blasphemy laws need to be reviewed and debated at the national level, instead of being exported to the free world, as Pakistan -- with the help of the UN Human Rights Council's Resolution 16/18 and Secretary of State Hillary Clinton in the Istanbul Process -- were trying to do. The international community, the so-called human rights groups and the somnolent media urgently need to protect Christians and others against these blasphemy laws so that this sort of "justice" can be stopped.